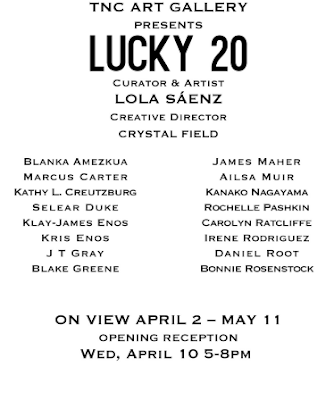 Tonight is the opening reception for "Lucky 20," a group show curated by East Village resident (and EVG contributor) Lola Sáenz at the Theater for the New City Art Gallery, 155 First Ave. between Ninth Street and 10th Street. The opening reception happens tonight (April 10!) from 5:30 to 8. And the gallery is open for viewing daily from 10 a.m. to 9:30 p.m. through May 11. Thanks for putting together the great event Lola! It was a very fun time and a great show!